Besides the Tour de France, every four years France holds a 1200 kilometer bicycle race that goes from Paris to Brest and back to Paris (commonly known as "PBP"). This race began in 1891 and it's the oldest cycling event still being run. The story goes that the same year that this race started, a pastry chef along the bicycle route decided to make a celebration cake called Paris-Brest (pronounced pah-ree-brehst), to honor the race. It was made with a round of choux pastry (meant to resemble a bicycle wheel) that was sprinkled with almonds, and filled with a praline flavored cream. To make a Paris Brest you begin with a large ring of choux pastry. Choux pastry is a unique pastry in that it's first cooked on the stove top and then it's baked. You start by adding flour to a boiled mixture of butter and water/milk (like a roux). The mixture is cooked until it forms a smooth ball of dough. Next, it's removed from the heat and beaten eggs are added until you have a smooth, thick and shiny paste-like dough. This paste is piped into a large ring shape and baked, first at a high temperature so the pastry will rise quickly (leaving a hollow center) and to set the structure of the Paris Brest. Then the temperature is reduced and it is baked further to allow the outside of the shell to become firm, while at the same time allowing the inside of the pastry to dry out. You can cut a small slit into the side of the pastry at the end of baking to make sure it has dried out sufficiently, because if the inside dough is still very wet, the choux pastry will soften and deflate upon cooling. But don't worry if the shell still has a small amount of moist dough as this can simply be removed before filling the Paris Brest with your filling. Once the Paris Brest has cooled, it's cut in half horizontally and filled with loads of vanilla flavored whipped cream (Chantilly Cream). (This does deviate from the traditional filling of a praline flavored cream.) The finishing touch is to dust the top of the pastry with powdered sugar. In order to keep the shell crisp, fill with the cream shortly before serving. If you prefer a softer shell, assemble the Paris Brest a few hours, or even the day before serving. Just cover and store in the refrigerator. 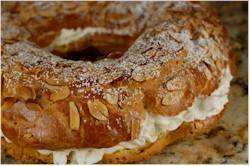 Paris Brest: Preheat your oven to 400 degrees F (200 degrees C) and place the rack in the center of the oven. Line a baking sheet with parchment paper. Draw an eight inch (20 cm) circle on the parchment paper to use as a guide when piping the choux pastry. In a bowl sift or whisk together the flour and salt. Place the butter, milk, water, and sugar in a heavy saucepan over medium heat and bring to a boil. Remove from heat and, with a wooden spoon or heatproof spatula, quickly stir in the flour mixture. Place your saucepan back over medium-low heat and stir constantly until the dough comes away from the sides of the pan and forms a thick smooth ball (about 3 minutes). Transfer the dough to your electric mixer (fitted with the paddle attachment), or you can use a hand mixer, and beat on low speed a minute or two to release the steam from the dough. Once the dough is lukewarm, start adding the lightly beaten eggs, in small additions, and continue to mix until you have a smooth thick shiny paste. (You will notice that the dough will separate and then come together. Continue to mix until you have a smooth thick paste that will fall from a spoon in a thick ribbon). Transfer the dough to a large piping bag fitted with a large plain tip (#4). Pipe a 1 inch (2.5 cm) thick ring of dough just inside the 8 inch (20 cm) circle that is drawn on the parchment paper. Pipe another 1 inch (2.5 cm) thick ring inside the first ring, making sure the rings of dough are touching. Pipe a final ring of dough on top, along the center seam between the first two rings of dough. Egg Wash: In a small bowl whisk the egg with the salt. With a pastry brush, brush the glaze gently on the top and sides of the dough, smoothing the rings of dough. Sprinkle with the shaved almonds. Bake for 15 minutes and then reduce the oven temperature to 350 degrees F (180 degrees C). Bake for a further 40-45 minutes or until the choux pastry is a golden brown color, puffed, and crisp. (Do not open the oven door while the choux pastry bakes or it might deflate.) Turn the oven off, leave the oven door slightly ajar, and leave the choux pastry in the oven so the shell can further dry out (about 30-45 minutes). Remove from oven and finish cooling on a wire rack. Whipped Cream: In a large mixing bowl, with the whisk attachment, beat the whipping cream with the vanilla extract and sugar until stiff peaks form. To Assemble: Split the pastry shell in half horizontally and remove any wet pieces of dough. Then spoon (or pipe) the whipped cream into the hollow center of the shell. Place the top half of the pastry shell on the whipped cream and dust the top of the Paris Brest with powdered (confectioners or icing) sugar.